Be the first to hear about their new releases and deals. Download the Booksprout app and search for Bette Lee Crosby today! It is the wit and wisdom of that Southern Mama Crosby brings to her works of fiction; the result is a delightful blend of humor, mystery and romance along with a cast of quirky charters who will steal your heart away. Her work was first recognized in 2006 when she received The National League of American Pen Women Award for a then unpublished manuscript. 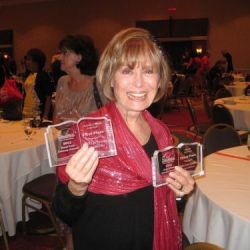 She has since gone on to win nineteen awards for her work; these include: The Royal Palm Literary Award, the FPA President's Book Award Gold Medal, Reader's Favorite Award Gold Medal, and the Reviewer's Choice Award. Crosby's published works to date are: Baby Girl (2016), What the Heart Remembers (2015), The Loft (2015), Memory House (2015), Passing through Perfect (2015), Wishing for Wonderful (2014), Blueberry Hill (2014), Previously Loved Treasures (2014), Jubilee's Journey (2013), What Matters Most (2013), The Twelfth Child (2012), Life in the Land of IS (2012), Cracks in the Sidewalk (2011), Spare Change (2011).